We've had an amazing and unique winter this year. I think in the past three weeks we probably broke the records for high temperatures at least three times. In fact, on Monday, we got up to 66 degrees in our part of Missouri! No, that is NOT a typo!!! The next day, however, the high was 26. Yeah, a 40-degree difference is a bit much. Anyway, when it was in the 60s on Monday, I, of course, couldn't pass up the opportunity to take a couple walks. Obviously, you won't be getting any hockey trophies on our pond yet, as the ice isn't stable. There is, however, some ice formed. This first photo is of some activity under the ice. (yes, I'm sure you're shocked). It was taken on a different day though. 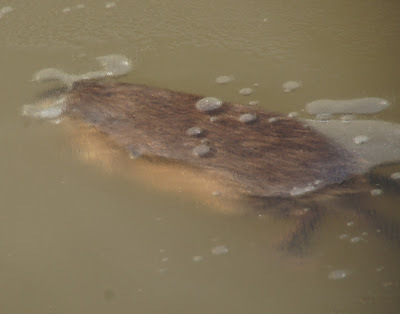 What a surprise to see the muskrat under the ice! That's a lovely shot of the sparrow. Love the bird! My post has birds this week too! Love the birdie but also enjoyed your furry friend under the ice! Happy Critter Day and thank you for hosting! Hi Misty, great sighting of the muskrat. And your Tree Sparrow is gorgeous. Great photos. That bird shot is magical! What a great shot of the muskrat under the ice! Your sparrow photo is beautiful, Misty! great shot of the sparrow, but stay away from that ice!! Great shots of both of them, my favorite is the sparrow. That bird shot is beautiful!!! Brrrr to swimming in cold water. But Mr. Muskrat seems to be doing ok. Hummm...I heard of ice skating, but what would you call this? Muskratting? I agree with everyone else, Misty. That tree sparrow photo is a winner. From the colors of the bokeh background to the expression on the bird's face, everything is perfect. I've never seen a muskrat in person, though, and I like your shot of this one swimming under thin ice. Great capture of the swimming muskrat! The bird shot is really beautiful! Great catch getting that muskrat under the ice. I remember having one pop up in my ice fishing tent once. It sat on the ice, got it's breath and left again. Made my day! That Sparrow shot is super! That's a gorgeous shot of the sparrow. Sweet capture of the swimming muskrat. Great captures! 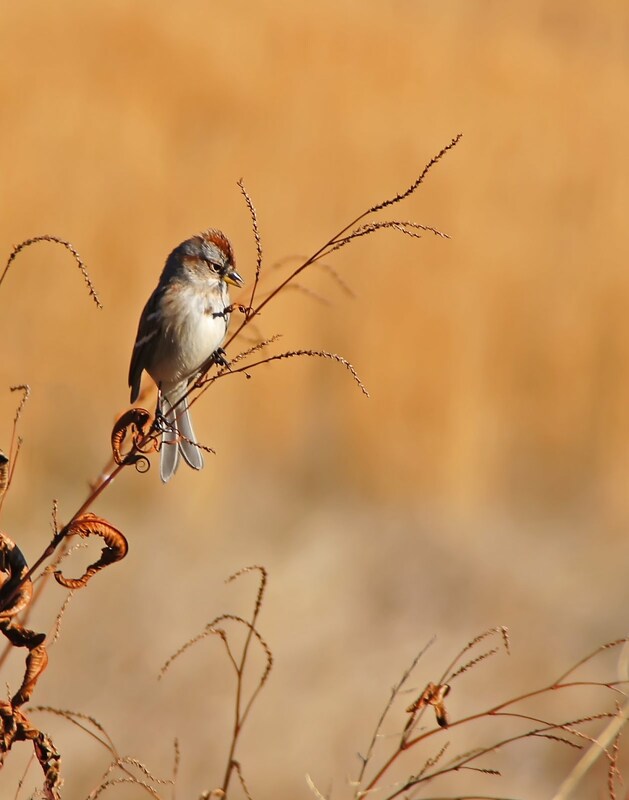 I absolutely love your image of the Tree Sparrow. I'm joining in (a little late) this week; my camera critter is on my Drive-By Photos blog. I love the shot of the muskrat how cute under the ice.